Or How We Spend the War in Vietnam. Aperture, New York, 2008. 128 pp., 75 tritone illustrations, 11¾x10". 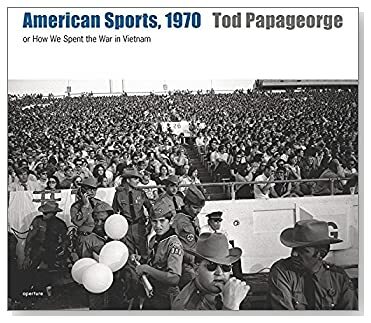 Coolly observational yet intensely engaging, the immensely influential American photographer Tod Papageorge's American Sports, 1970 draws a subtle but sharp parallel between the war in Vietnam and the American attitude toward spectator sports during a time of conflict. In 1970, a watershed year for popular opinion against the war, Papageorge was awarded a Guggenheim Foundation grant. His ostensible subject-sports and its role in American life-quickly became charged with the political, racial and sexual conflicts ignited by the war. Each and every picture is electric with disquiet. Military men in uniform parade across a field or relax in the stands. Cheerleaders rehearse beneath the gaze of the police. A couple sprawls and embraces in the debris of the Indianapolis 500. And hundreds of fans are drawn in unsettling group portraits at various stadiums and in the stands of many classic American sporting events. Papageorge eloquently and palpably captures the civic and psychic distress of the time on the faces of his subjects and in their gestures and interactions. This is a remarkable, unexpected body of work-published here for the first time-by an artist and teacher who has shaped the creative efforts of many of the most influential American photographers of the past three decades.